As the global EDM bubble inflates towards bursting point with many DJs seeming to be constantly chasing bigger stages, larger crowds and increasingly over-inflated fees, in 2014, Seth Troxler plans to do something completely different. Seth will be going back to his roots, playing regularly at clubbing institutions that he feels best represent everything that he stands for. The concept behind ‘Seth Troxler Goes Clubbing’ will see Seth commit to play regularly at those nightclubs that have been integral in moulding him into the DJ he is today. 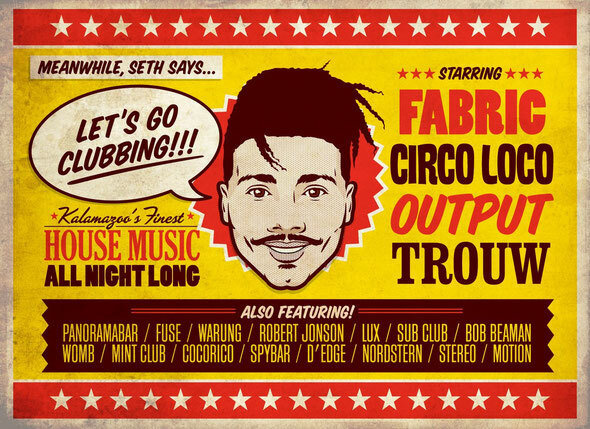 Circo Loco (Ibiza): Building on three previous summer residencies at Ibiza’s best known underground club, Seth will be embarking on another ten date run of shows throughout summer 2014 starting in mid June and running through to the closing in October. fabric (London): While the only people who can truly call themselves fabric ‘residents’ are Craig Richards and Terry Francis, Seth will headlining Room One once a quarter throughout 2014 starting on Saturday 15th February. Trouw (Amsterdam): Seth will be undertaking a quarterly residency at Amsterdam’s underground institution which will see him inviting some of his favorite DJs to play alongside him and also getting involved cooking and curating menus in the club’s restaurant, starting on 21st February. Output (New York): Another quarterly residency playing a mixture of all night shows and alongside hand-picked guests at New York’s newest underground venue starting on the 22nd March. He will also be playing multiple gigs throughout the year at other venues that have played a key part in supporting him over the years like Panoramabar (Berlin), Womb (Tokyo), Warung (Itaji), Lux (Lisbon), Fuse (Brussels), Robert Jonson (Offenbach), D’Edge (Sao Paulo), Sub Club (Glasgow), Bobbeaman (Munich), Spybar (Chicago), Coco Rico (Riccione), Stereo (Montreal), Mint Club (Leeds), Sound (LA) and Nordstern (Basel).